It's not hard to find analysts who argue that this recovery owes everything to the Fed's massive injections of liquidity. By pumping money and keeping short-term interest rates near zero, the Fed has forced liquidity into risky assets, thus propping up equity prices excessively and artificially. As long-time readers of this blog know, I think that argument is weak at best. The Fed has not been printing money with its Quantitative Easing programs. The Fed has simply been swapping bank reserves (which are functionally equivalent to T-bills) for notes and bonds, and they have been doing this in size in order to accommodate the world's demand for safe assets. The Fed hasn't been dumping tons of new money into the system, the Fed has been supplying liquidity that the market demanded. We haven't seen any unusual increase in inflation because the Fed's supply of money has been equal to the demand for money. But even if the Fed were "pumping" money into the economy, it's a stretch to think that extra money can translate into real growth. If printing money could make an economy grow, Zimbabwe and Argentina would be economic powerhouses—but they aren't. Printing money that no one wants is the basic recipe for inflation, and that's not been the story of the current business expansion in the U.S. economy. 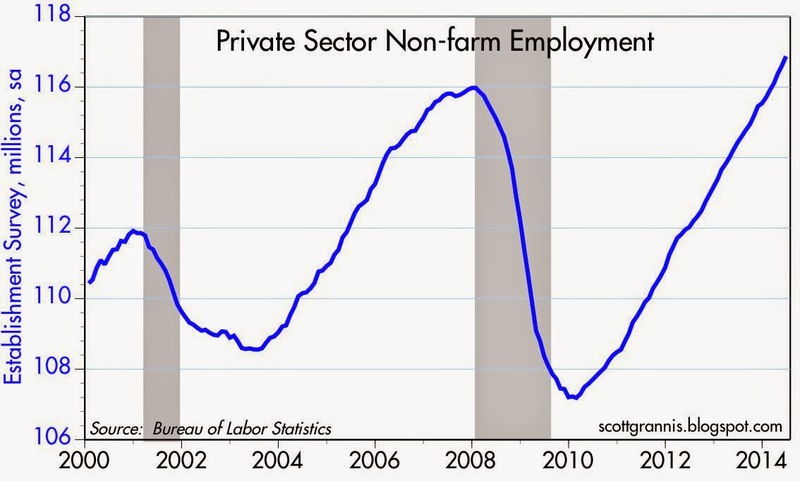 Here are some charts that focus on the physical growth of the U.S. economy. This is real growth, not make-believe, liquidity-driven growth. Manufacturing production (the volume output of industrial establishments in mining, quarrying, manufacturing, and public utilities) has increased by 25% in the past five years. It's almost at a new all-time high. 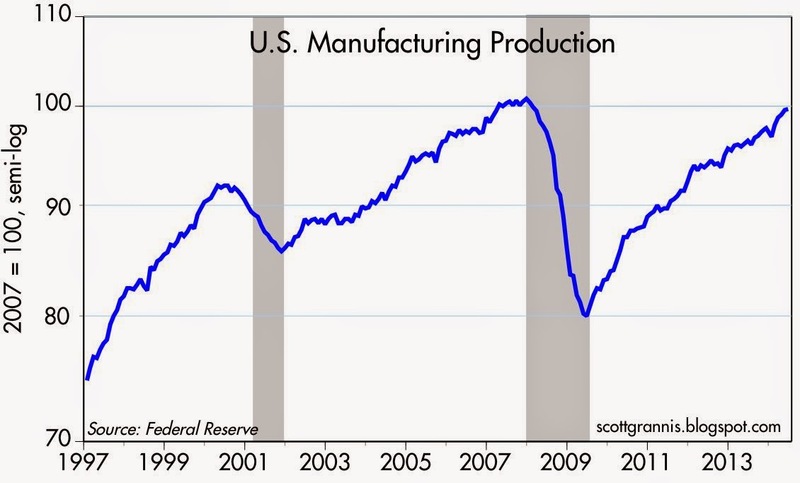 The manufacturing side of the economy survived, and has largely recovered from, its steepest plunge in history. 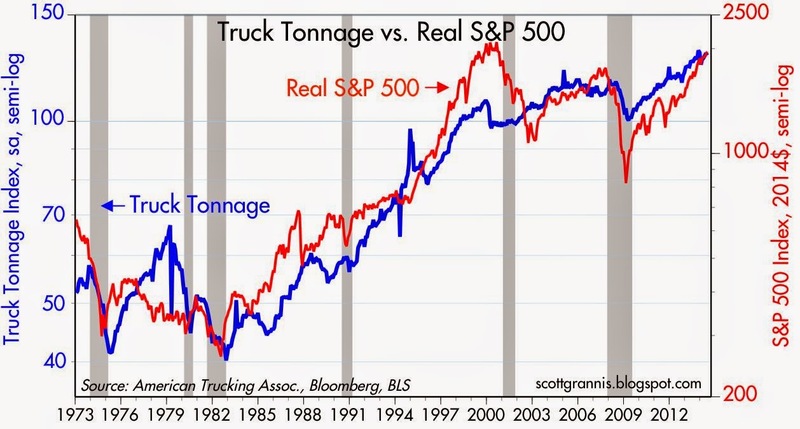 Actual shipments by truck, rail, waterways, pipelines and aircraft, as measured in ton-miles by the Dept. 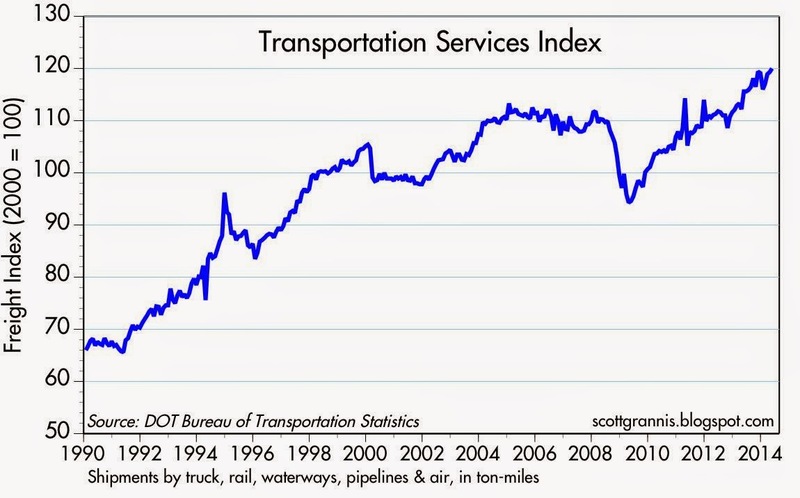 of Transportation, has increased over 25% in the past five years, and is now at a new all-time high. 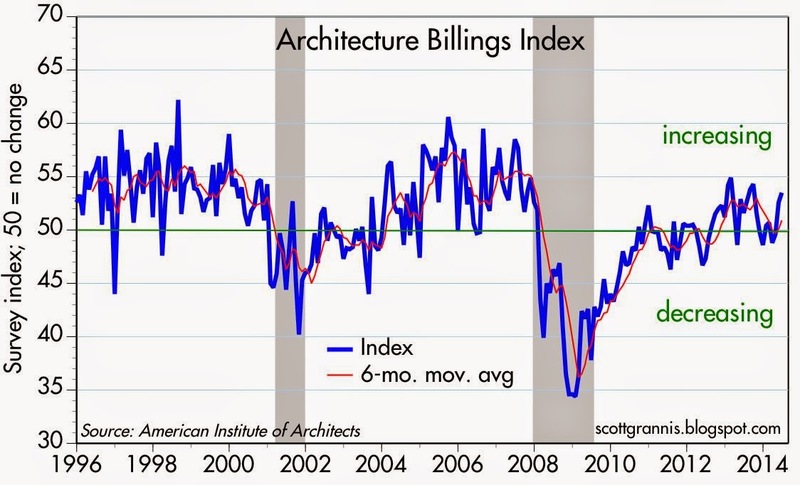 The nation's architectural firms report an increasing number of billings, a good sign that the commercial real estate market is expanding. 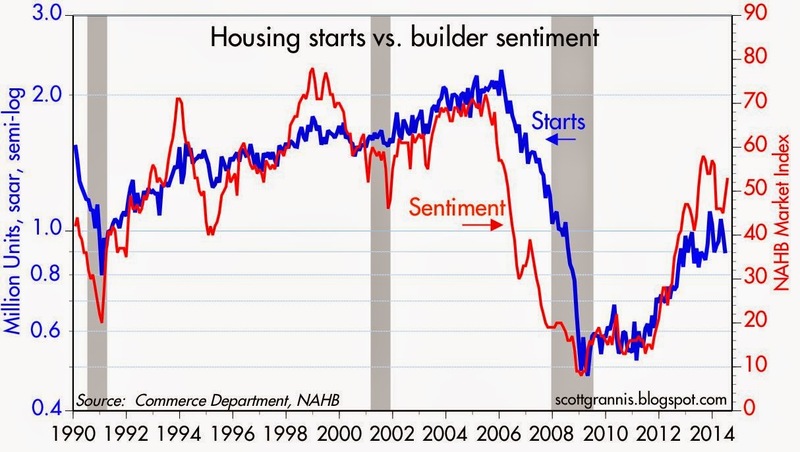 New housing starts are up about 80% in the past five years, and builders appear reasonably confident that construction activity will continue to increase. 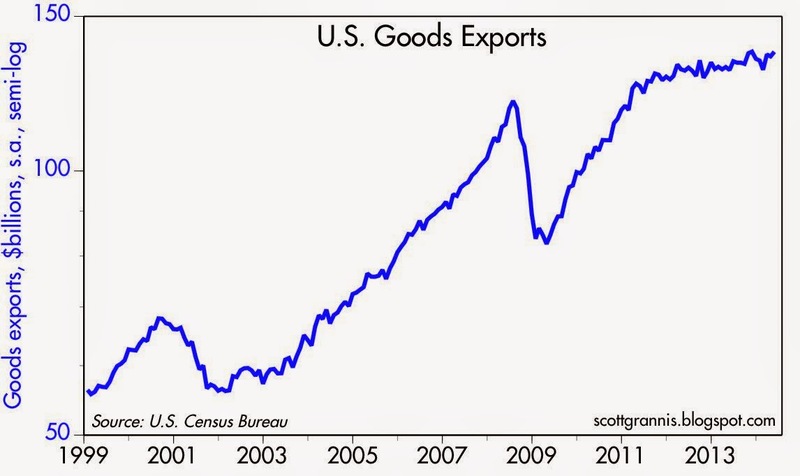 U.S. exports of goods have increased 65% in the past five years and are at a new all-time high. 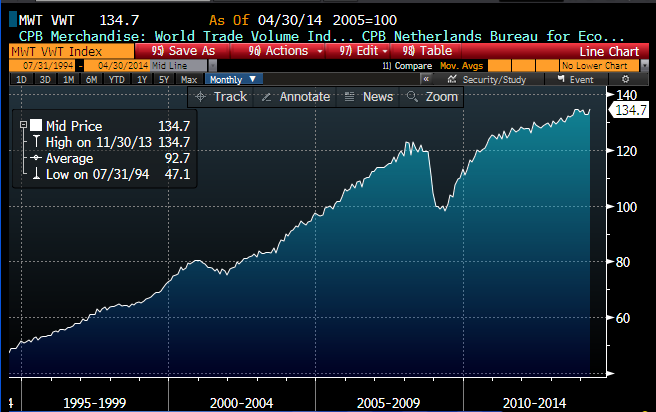 World trade volume has increased almost 35% in the past five years, and is now at an all-time high. 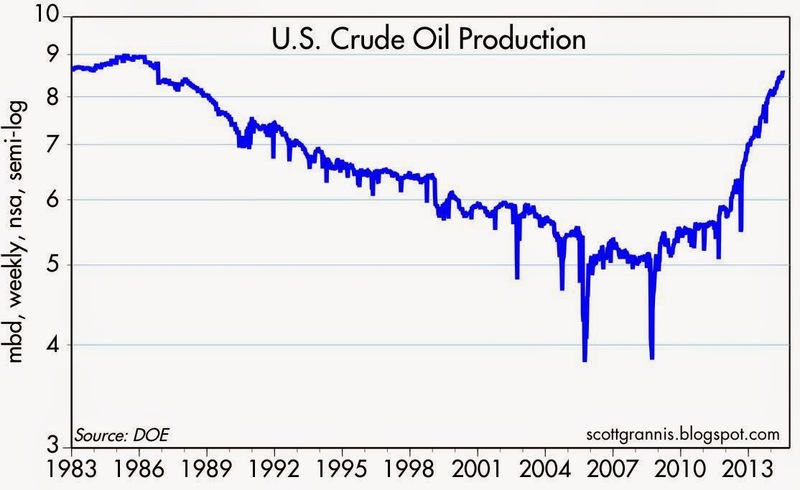 U.S. crude oil production has surged over 70% in the past five years, with the result that the U.S. has surpassed Saudi Arabia as the world's largest oil producer. Back in 2008 this would have been unthinkable, and it's all due to the ingenuity of oil producers (i.e., fracking technology). 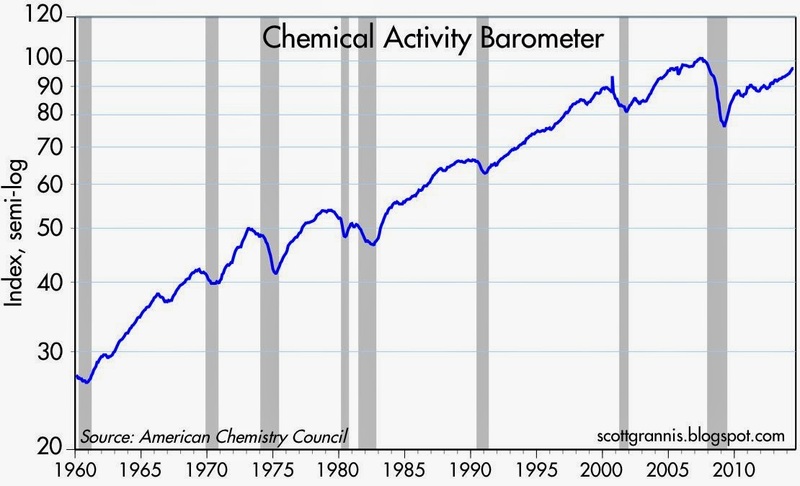 A composite index of chemical industry activity has increased 27% in the past five years, and has grown by 4.3% in the year ending June 2014—a good indicator that the U.S. economy continues to grow. The private sector has created almost 10 million jobs in the past four years, and private sector jobs are now at a new all-time high. 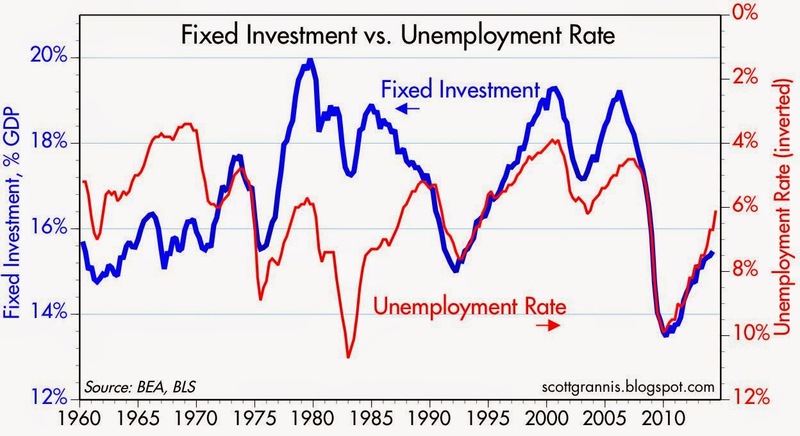 The jobs market is stronger and unemployment is lower primarily because fixed investment (e.g., investment in new things—new buildings, new homes, new plant and equipment) has increased faster than the overall economy. There's still a lot of room for all of these indicators to improve. It's still the case that this has been the weakest recovery in history. But it is nevertheless a recovery, and the economy has without question been growing in a real, physical sense. This is a genuine economic expansion, and the rise in equity prices is a reflection of that growth. It's not a liquidity-driven mirage, it's real. Good examples of the US Production Possibilities Frontier shifting out supported by an increase in the factors of production: Land, Labor, Capital, and Entrepreneurship. Thanks for ALL the excellent data and easy to understand commentary that you provide. of which had lagging growth. Do you truss the FBR? Scott has been right in minimizing the role the Fed is playing in the US economy, while most of the media and analysis community obsess about the Fed. Just look at German yields (10 yr at sub 1.2%) and Japan yields (10 yr at near 0.5%). There has been no big central bank actions in Europe or Japan to create these rates. The European and Japanese bureaucracies and vested interests did it all themselves. Unfortunately, the US is following the same model, which will do what the Fed could not even accomplish. Great line-up of charts, and analysis. You know, 20 years ago a guy had to plow through business magazines and speciality publications for less and more-dated information than we get from Scott Grannis every week. Although, sometimes it just makes me scratch my head harder! I guess the great QE controversy can never be resolved---the Fed's QE efforts did coincide with recovery, and not much inflation. True, bank reserves swelled, and banks/people sat on those reserves. But we also saw big rallies in property and equity markets, and 2.5 million new private-sector jobs a year, coincident to QE. The bank reserves might have come from offshore, or from increased saving rates in the USA. The QE money might have gone into property and equities. Or a mix of the two outcomes. You know, there is a whole cackling herd of tight-money enthusiasts insisting that QE money went not into banks but onto Wall Street! This is a hyped-up stock market bubble, they insist! Same with property markets. If you listen to critics, QE bubbled the stock markets, bubbled the property markets, swelled bank reserves and became inert, and launched hyper-inflation. And repressed returns for savers---though savings deposits boomed. And few observers seem to take into account we have globalized capital markets today. We have global savings rates and global pools of capital crossing borders. And then what is the Bank of Japan doing? Only satisfying demand for yen? QE seems to be working there too. Let's hope the recovery is underway, and survives the pending QE elimination.